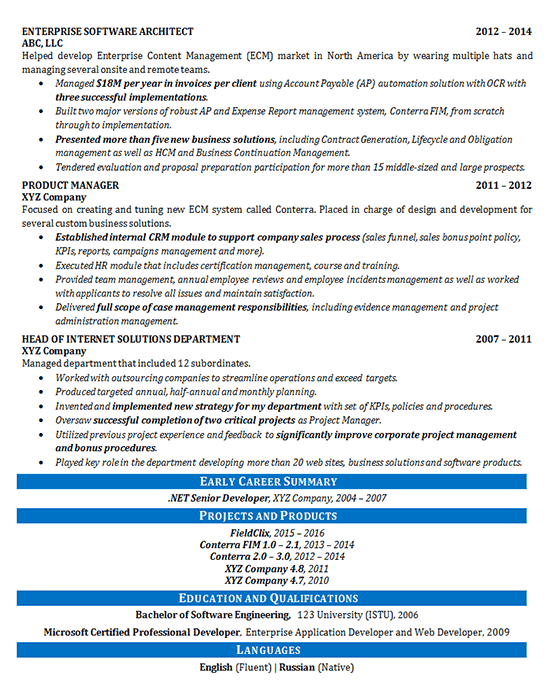 This resume was created for a client with a fairly extensive history as a production manager. The job candidate is also the owner of several products and product enhancements that he created. This professional possesses high-level proficiency across numerous technical areas that are difficult to find in many clients. To help promote his diverse skill set expertise, an introductory paragraph and summary of qualifications worked to highlight his most impactful contributions to a prospective employer. Throughout his employment history, the most critical accomplishments were written in bold font so that they stand out to the reader. Since most clients will not have the project and product ownership experience of this client, a separate section was created to list out these projects and products. Education background, qualifications and fluencies were listed to complete the resume and demonstrate just how well-rounded this client truly is and hopefully prove he is worthy of consideration. 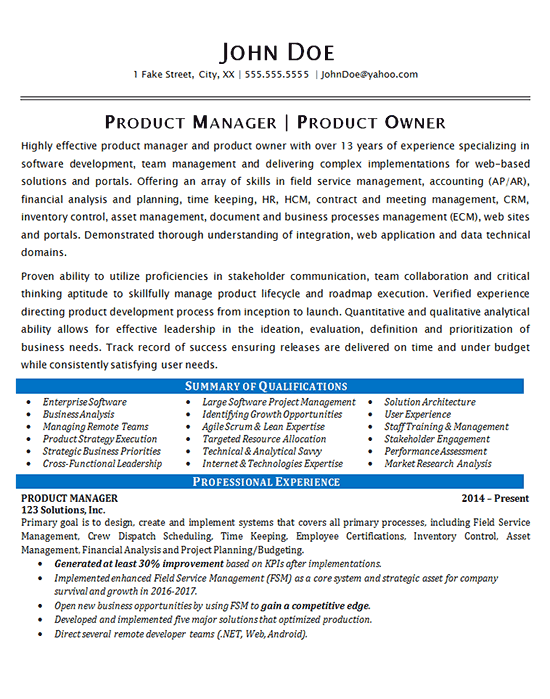 Highly effective product manager and product owner with over 13 years of experience specializing in software development, team management and delivering complex implementations for web-based solutions and portals. Offering an array of skills in field service management, accounting (AP/AR), financial analysis and planning, time keeping, HR, HCM, contract and meeting management, CRM, inventory control, asset management, document and business processes management (ECM), web sites and portals. Demonstrated thorough understanding of integration, web application and data technical domains. Proven ability to utilize proficiencies in stakeholder communication, team collaboration and critical thinking aptitude to skillfully manage product lifecycle and roadmap execution. Verified experience directing product development process from inception to launch. Quantitative and qualitative analytical ability allows for effective leadership in the ideation, evaluation, definition and prioritization of business needs. Track record of success ensuring releases are delivered on time and under budget while consistently satisfying user needs. Primary goal is to design, create and implement systems that covers all primary processes, including Field Service Management, Crew Dispatch Scheduling, Time Keeping, Employee Certifications, Inventory Control, Asset Management, Financial Analysis and Project Planning/Budgeting. Helped develop Enterprise Content Management (ECM) market in North America by wearing multiple hats and managing several onsite and remote teams. Focused on creating and tuning new ECM system called Conterra. Placed in charge of design and development for several custom business solutions.